The beginning of the month is one of my favorite times because it means the return of my favorite events with new rounds of things just waiting to jump into my shopping cart. The Men’s Dept. is probably by far my most favorite when it comes to just the gents as far as things go. It is hard not to go wild purchasing things left and right when I am there but I have learned to reign in it a little bit but that doesn’t mean I won’t be displaying some of the best and favorite things from it through the course of the month. From TMD for this particular look, I chose to wear the British Duffle Coat by ::K:: because I like coats that have a longer length. It has just always been one of my more preferred styles. It’s also nice that it has the built in shirt/sweater combination which comes with a HUD so that you can change their colors to get the exact combination that is perfect for you. It is just close enough to the end of the December round of Men Only Monthly, which shuts down on the 15th so they can switch everything for the new January round on the 20th. From this event I picked coordinating pants from Ascend. The Hideo Formal Trousers go excellent with the Triple Monk Shoes. The choice of colors for the trousers was a hard decision but I felt going with a monochrome outfit seemed to suit me best. The best thing is that they come in Fitmesh for most standard avatars and also for the mesh body crowd with [Signature] Gianni, Adam, SLink Physique, and also TMP. 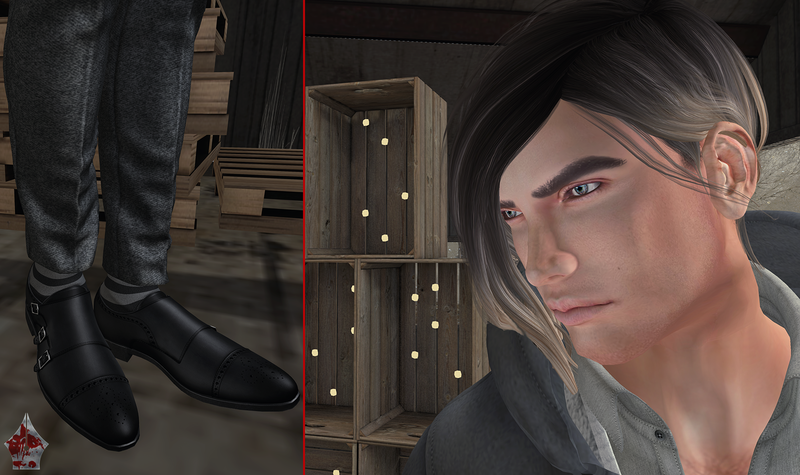 The shoes have an unfitted option for standard avatars and also for [Signature] Gianni, Adam, SLink, and TMP as well. The best part is that they come with a HUD to change the type of socks you want to wear. I love the choices they have added, argyle is a style that I prefer in the real world so it’s great to see it represented here on the grid. The Crossroads event seems to be getting a lot of my attention as I used products from it in my last posting and has made it again this time as well. tram has released a very nice long hair that flows off to the left side of the body, over the ear with a slight little pony bob at the back. Being that I have a hard time choosing hair colors I grabbed the full package which comes with your usual monochrome, brown, and blonde tones but it also has some really nice ombre tones as well which is what I used for this look. For the other item for this event I am using a pose that is a part of The Dean set from an lar [poses]. Poses for me are kind of hard to describe but I like the overall mood of this set and hope to be able to use more of them for upcoming projects. Lastly, MESANGE has new eyes available at The Chapter Four. The Sekhmet Eyes come in 16 tones and have a newly updated HUD so that you can have different sized iris/pupils. I think it’s a welcome upgrade to the original products that were previously released. MESANGE just keeps getting better and better over time. We’ve come to the part of the post where we part ways and I give you the credits for the look so that you can go check out these for yourselves and explore all the things offered at these great events. I’ll see you out on the grid and until then, stay stylish fellas!